The graphical display of the structure of reasoning and argumentation. visually displays the structure of an argument. helps you evaluate what you are being told (by someone, by your readings) to decide if you accept or reject the claim. addresses the question, "Why should I believe that?" What's the point? Knowledge and understanding are created and evaluated through effective argumentation. Learning to map an argument will improve your ability to make effective arguments and your critical thinking skills. We might intuitively sense and argument succeeds or fails but the map allows us to inspect it and understand it in its entirety. For example, we can reject parts of an argument but still be convinced by a claim. Not all parts of an argument need to be as convincing as others, and in my experience they won't. For the mechanics of making a map on your computer, see concept mapping on this website. Also see: Austhink. Argument Mapping Tutorials. This tutorial uses the Rationale software but Cmap works better for our purposes. 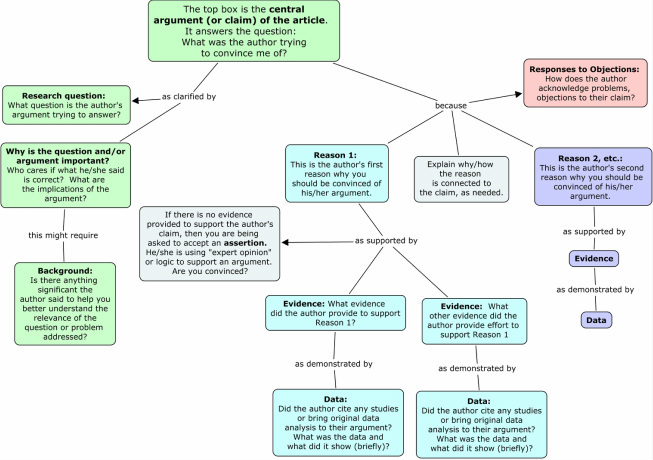 This is an argument map template I created. Your argument map should have a structure similar to this. Label your boxes with the titles in bold; this will help you evaluate the argument. Van Gelder (2011) What is Argument Mapping?